Have you ever seen Real Estate marketing that makes an offer something like “if we don’t sell your home we will buy it”? Is it legit? That would certainly solve some of your problems right? If you look around the internet there are plenty of sites out there that offer some kind of guaranteed home sale program. Some are based on timeframes, “We will guarantee your home is sold in 30 days, sold in 45 days, or sold in 90 days." The idea is if your home is not sold in X days, they'll buy it. To that I say, "Impossible." This real estate agent or investor is being at best, disingenuous. At worst they are being dishonest. 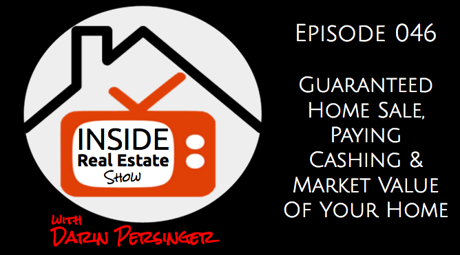 Darin Persinger, the host of Inside Real Estate Show shares some thoughts on guaranteed home sale programs, home buyers paying cash and market value of homes for sale.